We all want good sound. Whether relaxing on the couch at home or out in the park, it matters. The depth of bass, clarity of treble and richness in the middle range are ideal. A strong performance at all levels of volume is the goal. One must consider wattage, sensitivity and total harmonic distortion then. Portability has become more and more important for consumers. As has smart capabilities, but most manufacturers have not successfully married the two up until now. RMS (Root Mean Square) is an equation used to determine a speaker’s power. Its average power output over a long period of time is calculated. The value is often listed as “watts RMS” on product packaging. A normal conversation is around 60 decibels (dB), while the siren of an emergency vehicle is about twice that. Every 10dB increase makes the sound twice as loud. Wouldn’t it be great to be able to enjoy great sound, but also superior smart functionality? In the portable speaker realm, you can find the loud and the rugged. Soundboks was started by a group of young, party-loving guys from Denmark. Their dream was to craft a speaker that would make people dance, and withstand the wildest celebrations. Their independent spirit was impressive. They built their own first Proof of Concept and tweaked it. Eventually, another young Danish investor got involved and things got serious. They launched at Scandinavia’s largest music festival Roskilde a few years back, selling out quickly. The company’s latest creation the Soundboks 2 delivers a whopping 122 dB of sound and can be carried using a specially made back brace. It works with Bluetooth or AUX but does not support smart functions. The Fugoo Style offers a total of 20hrs battery life with the continuous play from a compact speaker. It also has limited smart capabilities via smartphone. It’s one of the most rugged and durable portable devices on the market – apparently even being mud-proof Sound-wise, it has 6 drivers, 2 tweeters and 2 mid/woofers. These are just two examples of portable speakers with great sound. They’re also two of the most durable. Volareo aims to sit comfortably among other smart speakers in the market when it comes to sound. The device is made to not only sit through but to go wherever you do. The speaker has a 10W RMS Dual Driver with Bass Boost. In its price range, the Volareo offers top-notch sound, with similar technical specs to the Google Home (which is not portable). It can also be charged wirelessly, meaning that you can easily have it ready for a day out. On top of that, it’s splash-proof, so can be enjoyed by the pool or on a mountaintop. 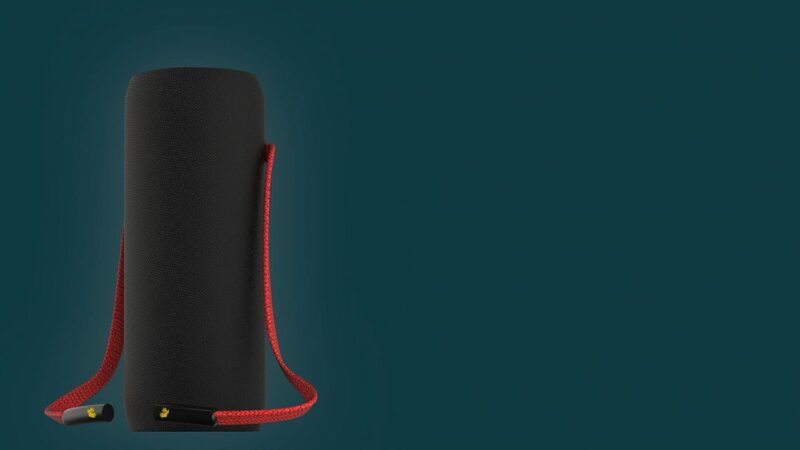 The smart and portable speaker market is evolving and Volareo is at the forefront of innovation within it. Within its own smart AI system, it stands out from the rest, which generally uses another’s. Value for money is high, providing a lot of bang for your buck. You can also be sure that Volareo will continue to tweak and better its product through software updates in the future.